While my current TV career amounts to occasional repeats of clips shows, whereupon people will usually tell me I’m on via Twitter and exclaim that my hair looks either nice or not as nice, and from that I’ll try and work out whether the show was filmed in 2002 or 2005, my Dad has been on BBC2 and BBCHD. 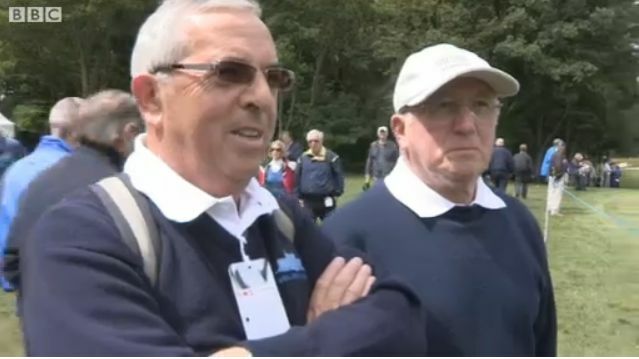 He went to Wentworth, the famous golf course, on Friday, to see some of the PGA Championship with his friend Ken – he and my Mum are golf mad, by the way – and in tribute to Seve Ballesteroes, who sadly died in May aged just 54, many of the players and spectators dressed in Seve’s trademark outfit, of navy jumper, navy trousers and white polo shirt. It looks from the BBC report to be a very sober but moving memorial, out there on the golf course, where Seve won over millions of fans. I am proud that my Dad was interviewed and that the interview was used on the BBC. He is cool. He was on Telly Addicts. (He and Mum were on Sky Sports, too, also talking about golf.) If you want to hear my Dad’s brief contribution, and see the full, two-minute film, it’s on the BBC Sport website, and Dad starts speaking at 01.11. I think there’s a joke about a golf link in there somewhere.